About - Advance Stamp & Sign Co.
Bernie Sitron had been working for his father Jack in their print shop for a number of years when Bernie realized that he wanted to move in a different direction. In June of 1955 Advance Stamp & Sign opened its doors in Norristown, PA. The initial shop sold rubber stamps, notary seals and other marking equipment. Bernie was running a successful business when his son Steve started working for him in 1971. Steve helped expand the business both in manufacturing technology and sales. Advance stamp started to show more focus in the sign industry while still selling marking equipment and rubber stamps. Steve became well versed in all aspects of the company. In 1984, after much growth and three location changes, Bernie was ready for retirement. Steve purchased the company from him and continued to expand the business. Original photos taken when we first opened in 1955. Steve’s son Elliot joined the company in 2005 with the desire to someday follow his father’s footsteps and one day own the company. When Elliot joined Advance Stamp & Sign so did some state of the art equipment. The laser engraver allows for more precise and more efficient manufacturing of stamps, seals and signs. The rotary engraver equipped with an automated braille system allows for the ability to manufacture ADA compliant signage. Advance Stamp & Sign’s Large Format Printer contributes to the company with brilliant print quality aiding in the manufacturing of indoor and outdoor signage. 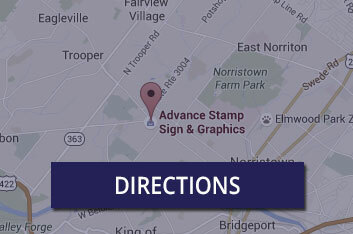 Steve purchased the building at Advance Stamp & Sign’s current location in West Norriton, PA. This location is the largest of the company’s history. The larger space allows for more expansive projects and easier manufacturing. Currently Advance Stamp & Sign has an all-star crew of employees making daily operation run smooth and efficient.